The OA Lite is a customizable sleeve-style wrap for mild osteoarthritis. Is the OA Lite Osteoarthritis Brace right for me? Sleeve-style wrap for mild osteoarthritis. The DonJoy OA Lite is a customizable sleeve-style wrap for mild osteoarthritis. Constructed from a neoprene alternative, DRYTEX - a unique, patented nylon core and polyester lycra fabric - it improves airflow while still giving ample support and compression. Perfect for those needing tissue containment in warm weather climates, or those with neoprene allergies. Adjustable pneumatic-condyle pad allows patient to"fine tune" load according to activity level. Cool, lightweight, breathable & washable design. Streamlined and low profile to fit under clothing. OA Knee braces stabilize the joint, help reduce pain which allows patients to return to the activities they love. Load redistribution and joint alignment Through a process called "off-loading" or shifting, OA braces help relieve pain by redistributing the weight bearing load on the painful or affected compartment of the joint to the healthy or unaffected compartment. Had surgery for medial and lateral meniscus years, chondroplasty of the patella and patella tracks laterally. PT says I have significant patella femoral compartment issues. Need a brace to wear for day to day activities. Just walking sitting up and down; no running or any sports. 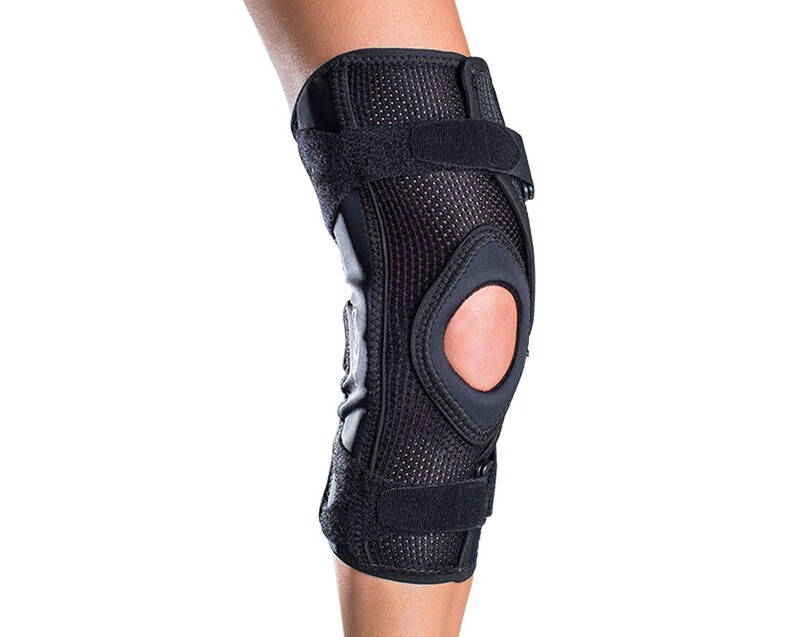 The Reaction Web Knee brace is a good choice for patelofemoral issues. The brace will disperse force on the front of the knee away from the kneecap and helps create pain relief in that area. The features description says this brace "Adjustable pneumatic-condyle pad allows patient to"fine tune" load according to activity level." How do I do this? Please explain better. The directions that came with the brace does not say anything about it. My elderly father has the knee brace, but it cause his skin to break out. Is there a suggestion that you can give me. He is very stubborn. Thank you. 1. Mild tricompartmental osteoaarthritic changes in the medial tibiofemoral compartment. 2. Degenerative changes and degenerative tear in the medial mensiscus. 5. Mild prepatellar and superficial infrapatellar bursitis. 6 Recent partial rupture of Baker's cyst. I had fallen down the stairs 3 years ago, recovered well, then last year after 2 weeks of lawn mowing on a bit of slope, couldn't walk. It's pretty good now, but occasional burning or pain. I'm wanting to protect it as I exercise, walk, dow housework, and return to gardening. Should I use a brace? I have OA in left knee and in pain 24/7. I used to play basketball all the time and would like to start again. My ligaments are fine, just no cartilage in fact at age 33 Dr wanted to do total knee. I am 41 now, is there a brace for this? If your doctor told you that you need a total knee replacement you have severe arthritis in your knee and the OA lite if for mild arthitis. Take a look at the OA Adjuster 3. https://www.betterbraces.com/donjoy-oa-adjuster-3-knee-brace This brace is for moderate to severe arthritis, you can play basketball in it. You would need to know which compartment you have the arthritis in so you can order the appropriate brace. The brace has an adjustable hinge that can un-load the side of the knee that hurts and create space between the joint to allow for less pain. is the oa-lite ok for medial meniscus tear injury. I have sent in this question earlier today but mistakenly indicated a lateral injury. It is a medial tear. Yes you would need to oredr a medial unloader. I was diagnosed with OA 2 years ago, after ACL reconstruction 10 years before that. I have played soccer all my life and have continued to do so after diagnosis (1x to 2x per week). I am looking for a brace that will provide the best support for this activity. Can you please advise? The OA Lite is an unloading OA brace that is mainly geared for a more sedentary population, not a highly active/athletic person. For your desired activity, the most appropriate brace would be the DonJoy OA FullForce knee brace. This will allow for the unloading of the affected OA compartment, ACL support for your athletic activity (soccer). I received the OA Lite Osteoarthritis knee brace from my Ortho Dr. today. Your site says it can be fine tuned as needed for the activity level, can you please elaborate on the fine tuning aspect? The OA Lite has an adjustable telescoping hinge in the brace that can be adjusted to unload your joint. The amount of unload you desire would depend on the type of activity you are doing (ie - at rest, walking, hiking, etc) to ensure patient comfort. The brace should have come with a patient key to allow you to adjust the hinge up to 6 degrees of correction. Will Medicare pay for some of these? Are any waterproof so you can workout in a pool? For insurance reimbursement questions please call 800-548-3370. All products are water resistant. Just simply hand wash with mild detergent and air dry. Rinse with fresh water after each use. To keep the hinges lubricated, use a dry lubricant such as TriFlow or White Lightening. We can also sell lubricant to you. Let us know if you have any other questions. I am looking at the DonJoy OA Lite Osteoarthritis Knee Brace. My knee's are more worn on the outside of my knee joints. Which braces do I order, the medial or the lateral? If the arthritis pain in your knee is on the outside, you're going to want to offload the lateral (or outside) on both knees. These knee braces are designed to help relieve just that sort of knee pain.